Do you like history? Do you like paper products? Want to work with an online scrapbook application? How about recording the volunteer efforts, awards, etc. of your fellow chapter members? 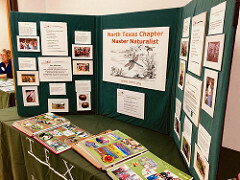 We are looking for someone to lead a team of your choosing to maintain our North Texas Master Naturalist scrapbook and get volunteer hours (VH) doing so. * Record in an attractive scrapbook manner for display at Open Houses, state conferences and public events. Please contact Connie Koval if interested at secretary@ntmn.org.